Figure 1. Semi-automated computer system for determination of ABR thresholds in mice. a. Before testing, mice are injected intraperitoneally (i.p.) with 2% Tribromoethanol at a dose of 0.2 mL/10 g body weight and placed on a heating pad set to body core temperature of 37°C. b. Once at proper anesthetic depth, corneal lubricant (artificial tears) is applied to prevent dehydration and corneal opacity. c. While under proper anesthetic depth, platinum electrodes are inserted subcutaneously. The negative electrode lead is inserted below the left earlobe, the positive lead is inserted on the top of the head and the ground lead is inserted between the eyes (Fig. 1). d. Speaker/microphone is placed in each ear at appropriate height level. Hearing function is assessed using auditory-evoked brainstem response (ABR) measurements obtained by a computer-aided evoked potential system (Intelligent Hearing System (IHS), Smart EP High Frequency System), which coordinates stimulus presentation, ABR acquisition, equipment control, and data management according to manufacturer's instructions. The Smart-EP version 10, modified for high frequency capability and coupled to high frequency transducers is used to generate specific acoustic stimuli or deliver pure tones or white noise at variable frequencies and decibels, as well as record the electrical activity of the hair cells along the auditory pathway. a. Biological signals are bandpass filtered below 100 Hz and above 3000 Hz and amplified 200,000 times; an A/D sampling rate of 25 kHz is employed. b. Analysis time is set at 10 ms and artifact rejection level at 31.00 µV. c. The amplified responses are averaged by a computer and displayed on the computer screen. d. Auditory thresholds are obtained for each stimulus by reducing the sound pressure level (SPL) at 10 dB steps and finally at 5 dB steps up and down to identify the lowest level at which an ABR can be recognized. This is done by comparing the ABR patterns with two or three suprathreshold ABRs displayed successively on the screen. e. The ABRs are typically identified with 128-512 stimuli presented at the rate of 19.1/s; low amplitude responses require more stimulus presentations to verify an ABR pattern just above its threshold. f. Waveforms for click and tone bursts are digitally created and stored for later reference. g. A half cosine square window is used to create tone burst signals with a 3 ms duration (1.5 ms rise-fall with no plateau). h. Click stimuli are calibrated with the 'impulse' function and tone pips with 'RMS fast' function of the measuring amplifier. A click has substantial energy in the 2-8 kHz range (e.g., filtering frequencies above and below this decreases the SPL by less than 5 dB). i. Specific acoustic stimuli are then delivered to the outer ear canal through a plastic tubing connected to funnel-speakerphone from the high frequency transducers. Filters are set to exclude signals above 3000 and below 100 Hz; amplification is at 200,000 micro volts. j. First sound stimulus presented consists of a white-noise click (2-8 kHz) at 70 dB, and depending on the response, is followed by increasing or decreasing volumes initially in 10 and subsequently in 5 dB steps to determine the auditory threshold; averaged responses are digitized and displayed on PC screen. a. While mice are still fully anesthetized they are tested with a series of increasing stimulus frequencies. Once the auditory threshold is determined with the initial sound stimulus clicks, the series is then repeated for stimulus frequencies of 8, 16 and 32 kHz and with a duration of 3 ms rise, and 1.5 ms fall time. b. Click-evoked ABR waveforms, obtained at threshold (T) and at T+10, T+20 and T+30 dB for each mouse, are stored for future reference. Mice that show no responses are determined to be deaf. Those with elevated thresholds (strain and age-dependent) are retested to confirm the findings. c. Sound pressure level thresholds are determined for each stimulus frequency by identifying the lowest intensity producing a recognizable ABR pattern on the computer screen (at least two consistent characteristic wave forms). d. Auditory-evoked brainstem response in the form electrical activity originating from auditory hair cells are transmitted along the auditory neural pathway (Fig. 2) and displayed in characteristic wave forms that are amplified, recorded and analyzed in terms of latency of signal transmission in anesthetized mice. e. Peak-to-peak amplitudes and wave latencies are derived using IHS software. Five peaks are produced in response to auditory stimuli in a healthy mouse, each representing a different step in the neural pathway: 1) Organ of Corti, 2) Spiral Ganglion, 3) Cochlear Nucleus, 4) Superior Olivary Complex, and 5) Inferior Colliculus (see Fig. 2). f. Mice of the CBA/CaJ strain are tested periodically as references for normal hearing, and for monitoring the reliability of the equipment and testing procedures. g. Mice are allowed to recover from anesthesia under a heat lamp upon completion of ABR testing. Figure 2 . 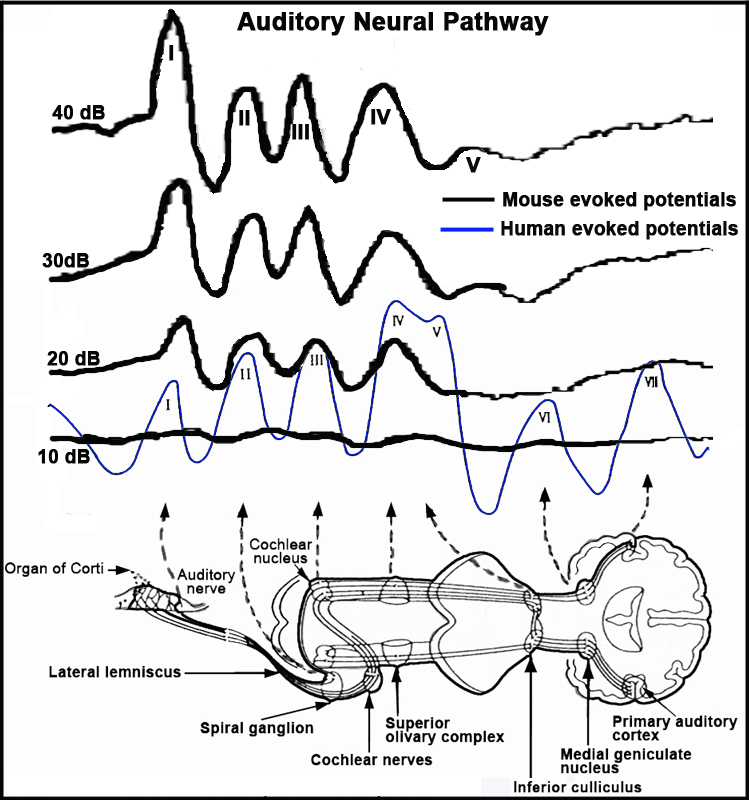 Schematic representation of the auditory evoked potentials and auditory neural pathway in the mouse. Table 1: Normal decibel ranges based on Zheng, Johnson and Erway (1999).